Hello friends from sunny Bogota! We have spent the last few days exploring this beautiful, colorful city! 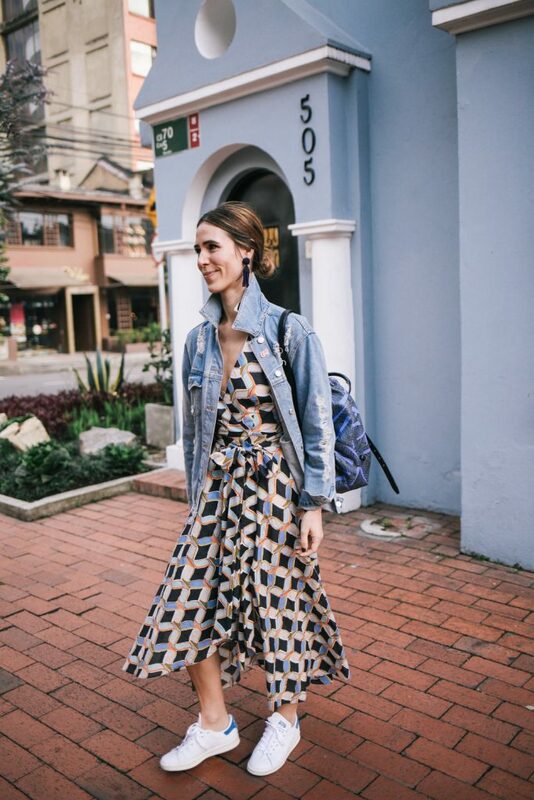 I’ve never ventured to the South America so we were super excited prepping for this trip! 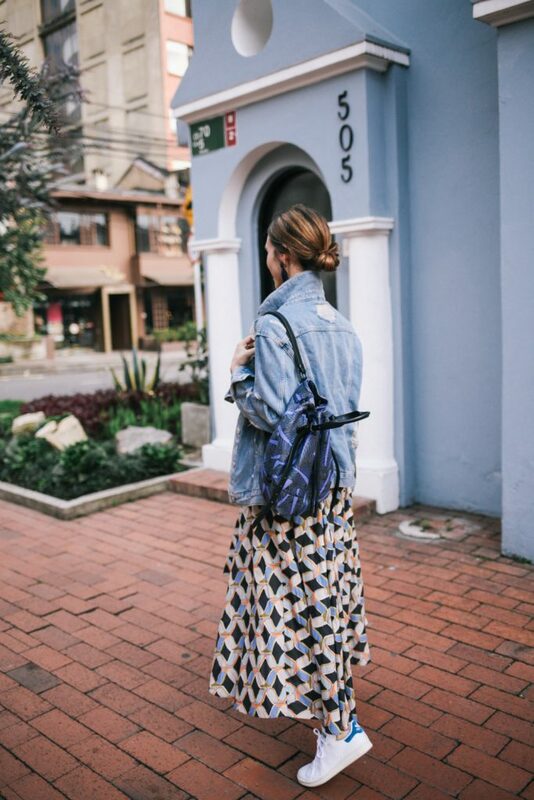 We spent the first day walking around Bogota making our way through every house in the city! We walked up to Mount Monsserante and took in views of the entire city! 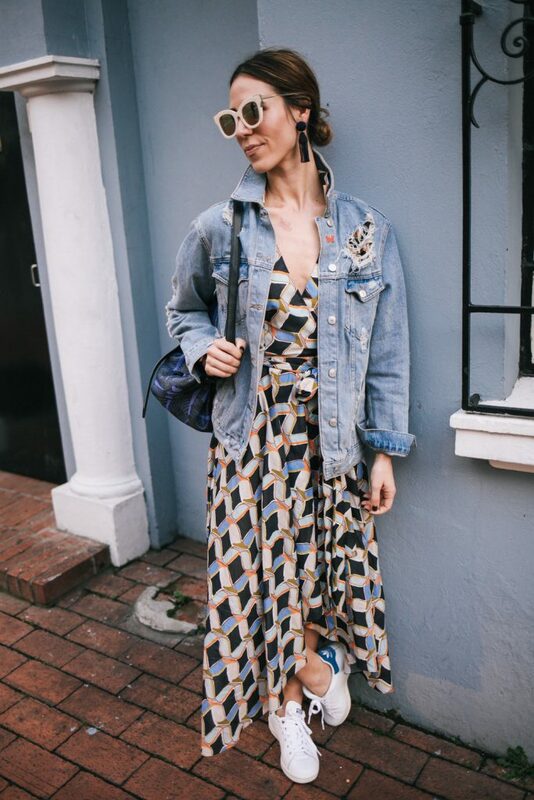 For an easy day around this city, I wore this GORGEOUS printed Milly Printed Valerie Dress from Rent the Runway – nothing says spring break better than a patterned maxi dress! Bogota is sun a beautiful city filled with such rich culture and color! Brian and I are coffee snobs and love researching the best local coffee shops and trying local blends. Columbia is the mecca of coffee so we have been itching with anticipation to try some local Columbian blends. Yesterday we tried Libertaio Coffee – one latte had me ready for the day! Today we are headed about an hour outside of the city for a waterfall hiking trip! Along the way we will get to visit a few small towns and check out the local markets! Be sure to follow along on InstaStories for live updates on the trip and shopable posts! Ok let’s get back to this dress shall we? While shopping on Rent the Runway for some vacation pieces, I stumbled across this GORGEOUS printed Milly Printed Valerie Dress! The hi-low cut makes it easy to pair with sneakers making it even easier for a long day of walking around the city! 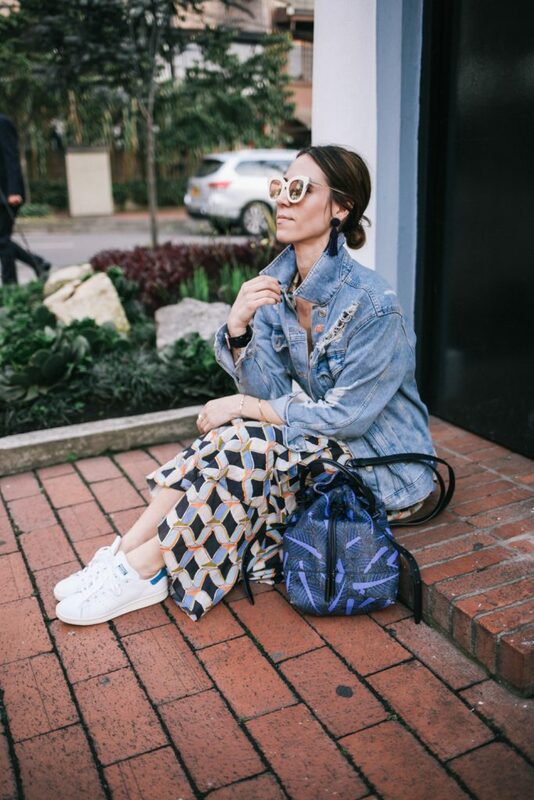 I love mixing causal and dressy pieces – it gives everything a little bit of versatility. Milly Printed Valerie Dress c/o – Love this printed dress from Rent the Runway! It’s perfect for spring! 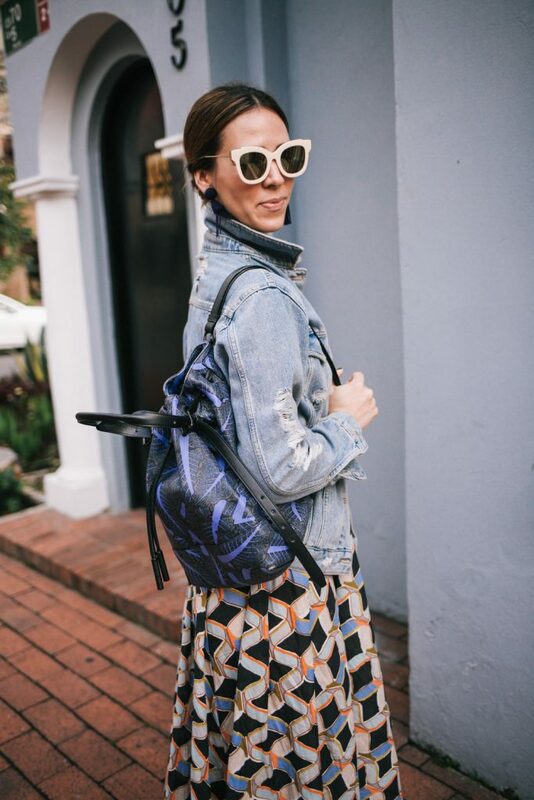 Opening Ceremony Backpack c/o – This backpack is made of THE most perfect print! Distressed Denim Jacket – I never leave home without this jacket! It’s great for travel! Stan Smith Sneakers – These shoes are the peanut butter to my jelly when it comes to traveling! Mirrored Sunglasses – Love these sunnies and they are only $12! Oscar De La Renta Earrings c/o – My first time wearing earrings and I loved it! Adding accessories to the look was the fun part – ok, confession, I don’t have pierced ears so these are my “first” pair of earrings! Ha, yes , they are clip-ons, but I couldn’t resist them, plus I have FOMO of these dangling earrings. These sunglasses were a purchase from Nordstrom earlier this week and are only $12!! Be sure to shop them here! 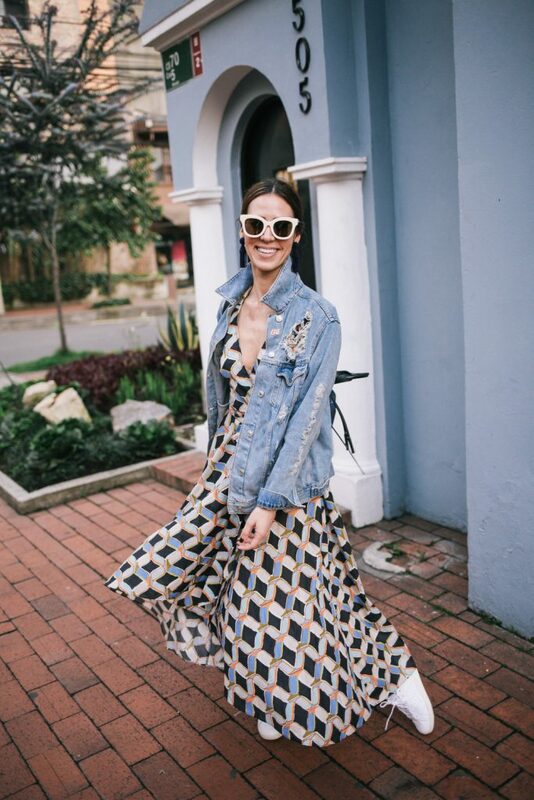 For some final touches, I layered this distressed denim jacket over the dress. Sure it’s March, but it’s a little chilly in Bogota! This jacket has come in handy for any season and it’s worth the $60! 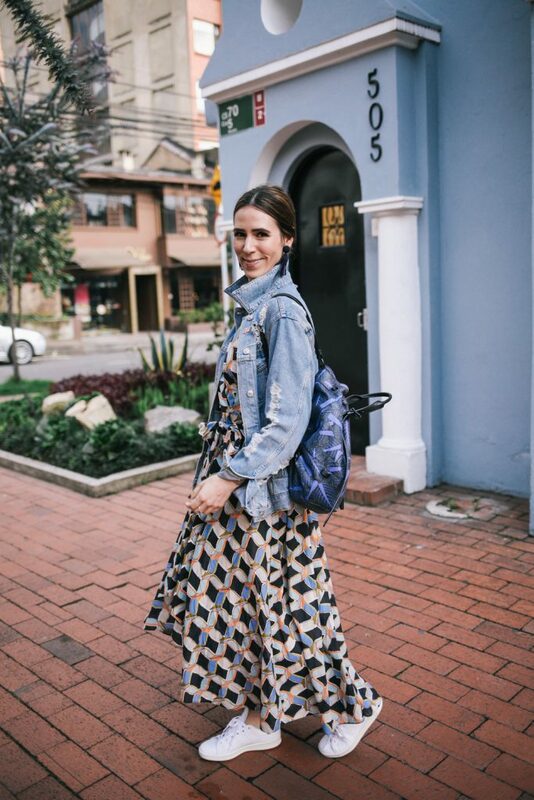 Finally, this backpack from Rent the Runway might be one of my favorite rentals yet! How gorgeous is this print!! Backpacks are always great for traveling – I’m able to include all my “mom” things for us while we are out and about, and my DSLR! Be sure to follow along on Instagram for updates on our trip! Happy Friday! Thank you to Rent the Runway for providing product for this post! 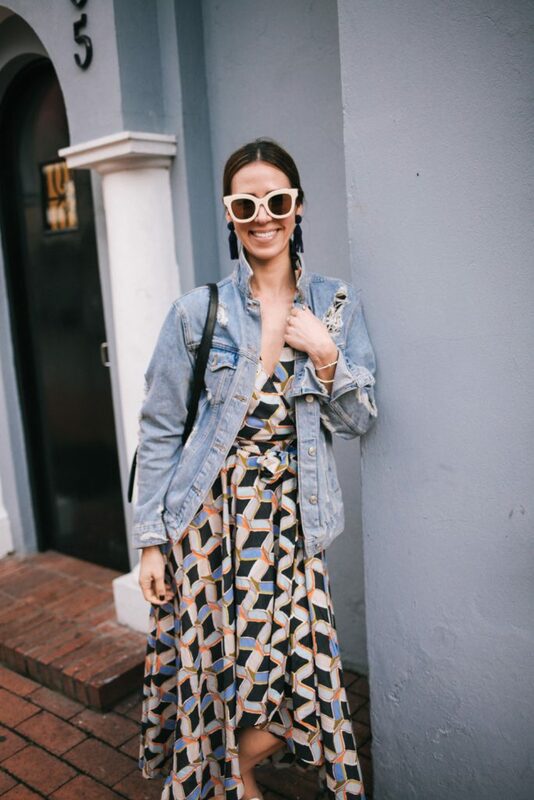 I love a good dress, this print is so pretty, and I just love the way you styled it! Your dress is so pretty, but those sunglasses are amazing! I love this outfit! This dress and the whole look is so fabulous on you! I love the jacket too. This dress is so pretty! I love the print and it looks like the perfect vacation friendly dress! I simply want to tell you that I am just new to blogging and site-building and seriously enjoyed this web-site. Almost certainly I’m likely to bookmark your blog post . You certainly have perfect well written articles. Thanks for sharing with us your web page. Hiya, I’m really glad I have found this info. Nowadays bloggers publish just about gossip and net stuff and this is really annoying. A good website with interesting content, this is what I need. Thank you for making this website, and I will be visiting again. Do you do newsletters by email? Hey there. I discovered your website via Google at the same time as searching for a comparable subject, your site got here up. It appears great. I have bookmarked it in my google bookmarks to come back then. Hiya, I’m really glad I have found this info. Nowadays bloggers publish only about gossip and net stuff and this is really frustrating. A good website with interesting content, that is what I need. Thanks for making this web site, and I will be visiting again. Do you do newsletters by email? Hello there. I found your web site by the use of Google at the same time as searching for a similar subject, your site came up. It seems to be good. I’ve bookmarked it in my google bookmarks to visit then. Hiya, I am really glad I’ve found this information. Today bloggers publish just about gossip and web stuff and this is actually annoying. A good website with exciting content, this is what I need. Thanks for making this site, and I will be visiting again. Do you do newsletters by email? Hiya, I’m really glad I have found this information. Today bloggers publish just about gossip and net stuff and this is actually annoying. A good blog with interesting content, that is what I need. Thank you for making this site, and I will be visiting again. Do you do newsletters by email? Hiya, I am really glad I’ve found this information. Today bloggers publish only about gossip and internet stuff and this is actually irritating. A good site with interesting content, this is what I need. Thanks for making this web-site, and I will be visiting again. Do you do newsletters by email? Hey there. I found your web site by the use of Google even as searching for a similar topic, your web site got here up. It seems good. I have bookmarked it in my google bookmarks to come back then. Hello there. I found your web site by means of Google even as looking for a related topic, your web site got here up. It appears good. I have bookmarked it in my google bookmarks to visit then. Hiya, I am really glad I have found this info. Nowadays bloggers publish only about gossip and web stuff and this is really irritating. A good site with exciting content, this is what I need. Thanks for making this web-site, and I will be visiting again. Do you do newsletters by email? Hiya, I am really glad I have found this info. Nowadays bloggers publish only about gossip and web stuff and this is really irritating. A good web site with interesting content, that is what I need. Thanks for making this site, and I’ll be visiting again. Do you do newsletters by email? Hi there. I found your site by way of Google while searching for a related topic, your web site came up. It appears to be great. I’ve bookmarked it in my google bookmarks to visit then. Hiya, I’m really glad I have found this information. Today bloggers publish just about gossip and web stuff and this is actually irritating. A good web site with interesting content, that’s what I need. Thank you for making this site, and I’ll be visiting again. Do you do newsletters by email? Hello there. I discovered your site by means of Google whilst searching for a related matter, your website got here up. It appears to be good. I’ve bookmarked it in my google bookmarks to visit then. Hey there. I discovered your blog via Google whilst looking for a comparable subject, your website got here up. It seems good. I have bookmarked it in my google bookmarks to come back then. Hello there. I discovered your site via Google even as searching for a related topic, your site got here up. It appears to be great. I have bookmarked it in my google bookmarks to come back then. Hi there. I found your web site by the use of Google whilst looking for a similar matter, your web site came up. It looks great. I have bookmarked it in my google bookmarks to come back then. Hiya, I am really glad I’ve found this information. Nowadays bloggers publish just about gossip and internet stuff and this is actually annoying. A good blog with exciting content, this is what I need. Thanks for making this website, and I will be visiting again. Do you do newsletters by email? Hello there. I found your web site by way of Google at the same time as searching for a related topic, your site came up. It appears good. I’ve bookmarked it in my google bookmarks to come back then. Hiya, I’m really glad I have found this information. Today bloggers publish only about gossip and internet stuff and this is actually irritating. A good blog with exciting content, this is what I need. Thank you for making this site, and I’ll be visiting again. Do you do newsletters by email? Hiya, I’m really glad I have found this info. Nowadays bloggers publish just about gossip and internet stuff and this is really annoying. A good site with interesting content, that is what I need. Thank you for making this web-site, and I will be visiting again. Do you do newsletters by email? Hello there. I discovered your blog by way of Google at the same time as searching for a related subject, your web site came up. It seems great. I’ve bookmarked it in my google bookmarks to visit then. Hi there. I found your site by the use of Google at the same time as looking for a related matter, your site got here up. It appears great. I have bookmarked it in my google bookmarks to come back then. Hiya, I’m really glad I have found this info. Today bloggers publish only about gossip and net stuff and this is really irritating. A good site with interesting content, that is what I need. Thanks for making this site, and I’ll be visiting again. Do you do newsletters by email? Hi there. I found your website by the use of Google while looking for a related topic, your site got here up. It appears to be great. I have bookmarked it in my google bookmarks to come back then. Hey there. I discovered your web site by way of Google whilst searching for a related matter, your site came up. It seems good. I’ve bookmarked it in my google bookmarks to visit then. Hey there. I discovered your website by way of Google at the same time as looking for a comparable matter, your website got here up. It looks good. I’ve bookmarked it in my google bookmarks to visit then. Hello there. I found your website by the use of Google while searching for a similar matter, your site came up. It appears to be good. I have bookmarked it in my google bookmarks to come back then. Hi there. I found your website by the use of Google at the same time as searching for a comparable subject, your site got here up. It seems good. I’ve bookmarked it in my google bookmarks to come back then. Hiya, I’m really glad I’ve found this information. Today bloggers publish just about gossip and internet stuff and this is really irritating. A good blog with interesting content, this is what I need. Thank you for making this web site, and I will be visiting again. Do you do newsletters by email? Hiya, I’m really glad I have found this info. Nowadays bloggers publish just about gossip and net stuff and this is actually frustrating. A good web site with exciting content, that is what I need. Thank you for making this website, and I will be visiting again. Do you do newsletters by email? Hiya, I am really glad I have found this info. Today bloggers publish only about gossip and net stuff and this is really irritating. A good site with interesting content, that is what I need. Thanks for making this website, and I will be visiting again. Do you do newsletters by email? Hiya, I’m really glad I’ve found this info. Nowadays bloggers publish just about gossip and net stuff and this is really frustrating. A good blog with exciting content, this is what I need. Thank you for making this website, and I will be visiting again. Do you do newsletters by email? Hiya, I am really glad I’ve found this info. Today bloggers publish just about gossip and web stuff and this is really irritating. A good blog with exciting content, this is what I need. Thank you for making this website, and I’ll be visiting again. Do you do newsletters by email? Hiya, I am really glad I have found this info. Today bloggers publish only about gossip and web stuff and this is really annoying. A good web site with interesting content, that is what I need. Thanks for making this website, and I’ll be visiting again. Do you do newsletters by email? Hiya, I’m really glad I’ve found this information. Nowadays bloggers publish just about gossip and internet stuff and this is actually annoying. A good web site with interesting content, this is what I need. Thank you for making this website, and I will be visiting again. Do you do newsletters by email? Hi there. I discovered your website via Google while searching for a comparable subject, your site got here up. It looks good. I have bookmarked it in my google bookmarks to come back then. Hiya, I’m really glad I have found this information. Nowadays bloggers publish just about gossip and net stuff and this is actually frustrating. A good site with interesting content, that is what I need. Thanks for making this web site, and I’ll be visiting again. Do you do newsletters by email? Hiya, I’m really glad I’ve found this info. Today bloggers publish only about gossip and internet stuff and this is actually annoying. A good web site with interesting content, that is what I need. Thanks for making this site, and I will be visiting again. Do you do newsletters by email? Hi there. I discovered your web site via Google while looking for a comparable matter, your site got here up. It seems to be good. I have bookmarked it in my google bookmarks to come back then. Hiya, I’m really glad I have found this info. Nowadays bloggers publish just about gossip and internet stuff and this is actually frustrating. A good web site with exciting content, this is what I need. Thank you for making this web site, and I will be visiting again. Do you do newsletters by email? Hiya, I am really glad I have found this information. Nowadays bloggers publish just about gossip and net stuff and this is really frustrating. A good site with interesting content, this is what I need. Thanks for making this site, and I will be visiting again. Do you do newsletters by email? Hello there. I found your blog by the use of Google at the same time as looking for a similar subject, your site got here up. It seems to be great. I’ve bookmarked it in my google bookmarks to come back then. Hiya, I’m really glad I’ve found this information. Today bloggers publish only about gossip and web stuff and this is really frustrating. A good website with interesting content, that is what I need. Thanks for making this site, and I’ll be visiting again. Do you do newsletters by email? Hello there. I found your site via Google while searching for a comparable matter, your web site got here up. It looks good. I’ve bookmarked it in my google bookmarks to visit then. Hello there. I discovered your blog by means of Google at the same time as looking for a related subject, your site came up. It seems to be good. I’ve bookmarked it in my google bookmarks to visit then. Hi there. I discovered your blog by way of Google at the same time as looking for a related subject, your site got here up. It seems to be good. I have bookmarked it in my google bookmarks to come back then. Hi there. I discovered your web site by means of Google while searching for a similar matter, your website came up. It seems to be great. I have bookmarked it in my google bookmarks to come back then. Hiya, I’m really glad I have found this info. Nowadays bloggers publish only about gossip and web stuff and this is really irritating. A good website with exciting content, this is what I need. Thanks for making this web-site, and I’ll be visiting again. Do you do newsletters by email? Hiya, I am really glad I have found this information. Today bloggers publish just about gossip and internet stuff and this is actually annoying. A good blog with exciting content, that’s what I need. Thanks for making this site, and I will be visiting again. Do you do newsletters by email? Hiya, I am really glad I have found this information. Nowadays bloggers publish only about gossip and internet stuff and this is really annoying. A good blog with exciting content, this is what I need. Thank you for making this website, and I’ll be visiting again. Do you do newsletters by email? Hiya, I’m really glad I’ve found this information. Today bloggers publish just about gossip and net stuff and this is really irritating. A good blog with interesting content, this is what I need. Thanks for making this site, and I will be visiting again. Do you do newsletters by email? Hey there. I found your website by way of Google at the same time as searching for a related matter, your website got here up. It seems good. I’ve bookmarked it in my google bookmarks to come back then. Hey there. I discovered your site by the use of Google whilst looking for a similar matter, your site came up. It looks good. I’ve bookmarked it in my google bookmarks to come back then. Hiya, I am really glad I have found this information. Nowadays bloggers publish only about gossip and net stuff and this is actually annoying. A good blog with interesting content, this is what I need. Thanks for making this web-site, and I will be visiting again. Do you do newsletters by email? Hey there. I discovered your website by way of Google while looking for a related topic, your site got here up. It appears good. I’ve bookmarked it in my google bookmarks to come back then. Hi there. I found your blog via Google whilst searching for a similar matter, your website got here up. It seems to be great. I have bookmarked it in my google bookmarks to come back then. Hello there. I found your blog via Google at the same time as looking for a similar matter, your site came up. It appears to be good. I have bookmarked it in my google bookmarks to come back then. Hiya, I’m really glad I’ve found this info. Nowadays bloggers publish only about gossip and internet stuff and this is really irritating. A good web site with exciting content, this is what I need. Thanks for making this web site, and I will be visiting again. Do you do newsletters by email? Hello there. I discovered your website by way of Google even as searching for a comparable topic, your site came up. It seems good. I’ve bookmarked it in my google bookmarks to visit then. Hiya, I’m really glad I’ve found this info. Today bloggers publish only about gossip and web stuff and this is really frustrating. A good site with interesting content, this is what I need. Thank you for making this website, and I’ll be visiting again. Do you do newsletters by email? Hi there. I discovered your web site by way of Google whilst searching for a similar subject, your website came up. It seems great. I’ve bookmarked it in my google bookmarks to visit then. Hi there. I discovered your site via Google whilst searching for a comparable matter, your site came up. It seems to be good. I’ve bookmarked it in my google bookmarks to visit then. Hiya, I’m really glad I’ve found this information. Nowadays bloggers publish just about gossip and net stuff and this is actually frustrating. A good blog with interesting content, this is what I need. Thanks for making this web site, and I will be visiting again. Do you do newsletters by email? Hello there. I discovered your site by way of Google even as searching for a similar topic, your website came up. It looks great. I have bookmarked it in my google bookmarks to visit then. Hiya, I am really glad I have found this info. Today bloggers publish only about gossip and net stuff and this is actually frustrating. A good site with interesting content, that’s what I need. Thanks for making this web site, and I will be visiting again. Do you do newsletters by email? Hiya, I am really glad I have found this information. Today bloggers publish just about gossip and web stuff and this is actually irritating. A good site with interesting content, this is what I need. Thanks for making this website, and I’ll be visiting again. Do you do newsletters by email? Hi there. I discovered your site by way of Google whilst searching for a comparable matter, your site came up. It seems good. I’ve bookmarked it in my google bookmarks to come back then. Hello there. I found your web site via Google at the same time as looking for a related topic, your site came up. It seems to be great. I’ve bookmarked it in my google bookmarks to visit then. Hi there. I discovered your site by means of Google at the same time as looking for a related matter, your website came up. It seems good. I’ve bookmarked it in my google bookmarks to come back then. Hiya, I’m really glad I’ve found this information. Today bloggers publish just about gossip and net stuff and this is really irritating. A good blog with exciting content, this is what I need. Thanks for making this site, and I’ll be visiting again. Do you do newsletters by email? Hiya, I’m really glad I’ve found this information. Today bloggers publish just about gossip and web stuff and this is actually frustrating. A good web site with interesting content, this is what I need. Thank you for making this website, and I’ll be visiting again. Do you do newsletters by email? Hiya, I’m really glad I’ve found this information. Nowadays bloggers publish just about gossip and internet stuff and this is really frustrating. A good website with interesting content, that’s what I need. Thank you for making this site, and I’ll be visiting again. Do you do newsletters by email? Hi there. I discovered your web site by the use of Google whilst looking for a comparable subject, your website came up. It seems great. I have bookmarked it in my google bookmarks to come back then. Hiya, I am really glad I’ve found this information. Nowadays bloggers publish just about gossip and web stuff and this is really frustrating. A good web site with interesting content, that is what I need. Thank you for making this website, and I’ll be visiting again. Do you do newsletters by email? Hiya, I’m really glad I’ve found this information. Nowadays bloggers publish just about gossip and internet stuff and this is really annoying. A good site with exciting content, that’s what I need. Thank you for making this web-site, and I’ll be visiting again. Do you do newsletters by email? Hi there. I discovered your web site via Google whilst looking for a similar topic, your site came up. It looks great. I’ve bookmarked it in my google bookmarks to visit then. Hi there. I found your blog via Google whilst looking for a comparable matter, your web site came up. It looks good. I’ve bookmarked it in my google bookmarks to come back then. Hello there. I found your site by means of Google while looking for a similar topic, your web site came up. It seems to be great. I’ve bookmarked it in my google bookmarks to come back then. Hey there. I discovered your blog by means of Google at the same time as searching for a similar matter, your site came up. It looks good. I’ve bookmarked it in my google bookmarks to come back then. Hello there. I discovered your blog via Google even as looking for a related topic, your site got here up. It appears great. I have bookmarked it in my google bookmarks to come back then. Hiya, I am really glad I have found this info. Today bloggers publish just about gossip and internet stuff and this is actually frustrating. A good blog with exciting content, that’s what I need. Thanks for making this web-site, and I’ll be visiting again. Do you do newsletters by email? Hello there. I found your blog by means of Google even as searching for a similar matter, your site came up. It seems to be good. I have bookmarked it in my google bookmarks to visit then. Hiya, I am really glad I have found this information. Today bloggers publish only about gossip and internet stuff and this is really frustrating. A good blog with interesting content, this is what I need. Thank you for making this site, and I will be visiting again. Do you do newsletters by email? Hello there. I discovered your blog by the use of Google at the same time as looking for a related matter, your web site got here up. It appears good. I’ve bookmarked it in my google bookmarks to visit then. Hello there. I found your web site by means of Google whilst searching for a similar topic, your website got here up. It appears great. I’ve bookmarked it in my google bookmarks to visit then. Hiya, I’m really glad I’ve found this info. Nowadays bloggers publish just about gossip and web stuff and this is actually frustrating. A good website with exciting content, this is what I need. Thanks for making this site, and I will be visiting again. Do you do newsletters by email? Hiya, I am really glad I’ve found this information. Nowadays bloggers publish just about gossip and internet stuff and this is really annoying. A good web site with exciting content, this is what I need. Thanks for making this website, and I’ll be visiting again. Do you do newsletters by email? Hey there. I discovered your blog by way of Google while searching for a related matter, your web site came up. It appears to be good. I’ve bookmarked it in my google bookmarks to visit then. Hello there. I discovered your web site by the use of Google at the same time as searching for a similar matter, your site came up. It looks great. I have bookmarked it in my google bookmarks to come back then. Hi there. I discovered your blog by means of Google even as searching for a comparable matter, your web site got here up. It looks great. I have bookmarked it in my google bookmarks to visit then. Hiya, I’m really glad I’ve found this info. Nowadays bloggers publish only about gossip and web stuff and this is actually frustrating. A good web site with interesting content, this is what I need. Thanks for making this web-site, and I will be visiting again. Do you do newsletters by email? Hiya, I am really glad I’ve found this info. Nowadays bloggers publish only about gossip and net stuff and this is really frustrating. A good blog with interesting content, this is what I need. Thank you for making this web-site, and I will be visiting again. Do you do newsletters by email? Hiya, I’m really glad I have found this information. Nowadays bloggers publish only about gossip and web stuff and this is actually irritating. A good blog with exciting content, that’s what I need. Thank you for making this web site, and I will be visiting again. Do you do newsletters by email? Hiya, I am really glad I have found this information. Today bloggers publish only about gossip and net stuff and this is actually frustrating. A good blog with interesting content, that’s what I need. Thank you for making this web site, and I’ll be visiting again. Do you do newsletters by email? Hiya, I am really glad I’ve found this information. Nowadays bloggers publish just about gossip and web stuff and this is actually frustrating. A good website with interesting content, that’s what I need. Thanks for making this web-site, and I will be visiting again. Do you do newsletters by email? Hi there. I found your web site by the use of Google while searching for a similar matter, your website came up. It seems to be good. I’ve bookmarked it in my google bookmarks to visit then. Hey there. I discovered your site by way of Google whilst looking for a comparable matter, your website got here up. It looks great. I have bookmarked it in my google bookmarks to visit then. Hiya, I am really glad I have found this info. Nowadays bloggers publish only about gossip and net stuff and this is actually irritating. A good website with exciting content, that is what I need. Thanks for making this website, and I will be visiting again. Do you do newsletters by email? Hiya, I am really glad I’ve found this info. Today bloggers publish just about gossip and web stuff and this is actually frustrating. A good website with exciting content, that is what I need. Thanks for making this website, and I’ll be visiting again. Do you do newsletters by email? Hey there. I found your blog by the use of Google even as looking for a related matter, your site came up. It looks good. I have bookmarked it in my google bookmarks to visit then. Hiya, I’m really glad I’ve found this information. Nowadays bloggers publish only about gossip and web stuff and this is actually frustrating. A good site with interesting content, that is what I need. Thanks for making this website, and I’ll be visiting again. Do you do newsletters by email? Hiya, I am really glad I have found this info. Today bloggers publish only about gossip and internet stuff and this is actually annoying. A good site with exciting content, this is what I need. Thank you for making this web site, and I will be visiting again. Do you do newsletters by email? Hello there. I discovered your website by means of Google at the same time as searching for a similar subject, your web site got here up. It seems great. I’ve bookmarked it in my google bookmarks to come back then. Hiya, I’m really glad I’ve found this info. Nowadays bloggers publish just about gossip and web stuff and this is actually frustrating. A good blog with interesting content, this is what I need. Thank you for making this site, and I’ll be visiting again. Do you do newsletters by email? Hiya, I am really glad I’ve found this info. Today bloggers publish only about gossip and internet stuff and this is really annoying. A good blog with exciting content, that is what I need. Thanks for making this web site, and I’ll be visiting again. Do you do newsletters by email? Hello there. I discovered your site via Google whilst searching for a similar subject, your site got here up. It seems good. I’ve bookmarked it in my google bookmarks to visit then. Hey there. I discovered your blog via Google even as searching for a similar subject, your site came up. It seems great. I’ve bookmarked it in my google bookmarks to visit then. Hello there. I found your site via Google while looking for a comparable subject, your site got here up. It appears to be good. I have bookmarked it in my google bookmarks to come back then. Hi there. I discovered your site by way of Google while searching for a comparable topic, your site got here up. It appears to be great. I’ve bookmarked it in my google bookmarks to visit then. Hiya, I’m really glad I have found this information. Nowadays bloggers publish just about gossip and internet stuff and this is really irritating. A good blog with exciting content, this is what I need. Thanks for making this site, and I will be visiting again. Do you do newsletters by email? Hiya, I’m really glad I’ve found this info. Nowadays bloggers publish just about gossip and net stuff and this is actually frustrating. A good site with interesting content, that is what I need. Thank you for making this web site, and I will be visiting again. Do you do newsletters by email? Hiya, I am really glad I have found this info. Today bloggers publish just about gossip and internet stuff and this is actually annoying. A good website with exciting content, that’s what I need. Thanks for making this site, and I’ll be visiting again. Do you do newsletters by email? Hi there. I found your website via Google even as searching for a similar matter, your web site got here up. It appears to be great. I’ve bookmarked it in my google bookmarks to visit then. Hiya, I am really glad I have found this information. Nowadays bloggers publish only about gossip and web stuff and this is really frustrating. A good site with interesting content, that’s what I need. Thank you for making this site, and I’ll be visiting again. Do you do newsletters by email? Hi there. I discovered your website by the use of Google at the same time as looking for a similar matter, your web site came up. It seems great. I’ve bookmarked it in my google bookmarks to visit then. Hi there. I discovered your site by the use of Google whilst looking for a related topic, your web site got here up. It appears great. I’ve bookmarked it in my google bookmarks to come back then. Hiya, I am really glad I have found this information. Nowadays bloggers publish just about gossip and web stuff and this is actually frustrating. A good site with exciting content, this is what I need. Thank you for making this website, and I’ll be visiting again. Do you do newsletters by email? Hiya, I am really glad I have found this information. Today bloggers publish only about gossip and net stuff and this is really annoying. A good site with interesting content, that is what I need. Thank you for making this web-site, and I will be visiting again. Do you do newsletters by email? Hey there. I found your site by means of Google whilst looking for a comparable topic, your site came up. It looks good. I have bookmarked it in my google bookmarks to visit then. Hi there. I found your web site by the use of Google while looking for a related matter, your website came up. It looks great. I’ve bookmarked it in my google bookmarks to come back then. Hi there. I discovered your site by way of Google at the same time as looking for a comparable matter, your website got here up. It appears to be great. I have bookmarked it in my google bookmarks to come back then. Hiya, I am really glad I have found this info. Today bloggers publish just about gossip and net stuff and this is actually frustrating. A good website with interesting content, this is what I need. Thanks for making this web site, and I’ll be visiting again. Do you do newsletters by email? Hello there. I found your blog by the use of Google even as searching for a comparable subject, your website got here up. It looks great. I’ve bookmarked it in my google bookmarks to come back then. Hi there. I found your blog by the use of Google at the same time as looking for a related subject, your web site got here up. It seems great. I’ve bookmarked it in my google bookmarks to come back then. Hello there. I discovered your website by way of Google whilst looking for a comparable subject, your web site got here up. It seems great. I have bookmarked it in my google bookmarks to visit then. Hello there. I found your site by means of Google whilst looking for a comparable topic, your site got here up. It looks good. I’ve bookmarked it in my google bookmarks to visit then. Hello there. I found your blog by means of Google even as searching for a similar matter, your site got here up. It appears to be good. I have bookmarked it in my google bookmarks to visit then. Hi there. I discovered your website by way of Google at the same time as searching for a related topic, your site came up. It seems to be great. I have bookmarked it in my google bookmarks to visit then. Hiya, I am really glad I’ve found this information. Today bloggers publish only about gossip and web stuff and this is actually frustrating. A good website with exciting content, that is what I need. Thank you for making this site, and I’ll be visiting again. Do you do newsletters by email? Hey there. I discovered your site by way of Google while searching for a comparable matter, your website came up. It looks great. I have bookmarked it in my google bookmarks to visit then. Hey there. I found your blog by way of Google while searching for a comparable topic, your website got here up. It appears great. I have bookmarked it in my google bookmarks to come back then. Hey there. I found your site via Google at the same time as searching for a similar matter, your website came up. It appears to be great. I’ve bookmarked it in my google bookmarks to come back then. Hi there. I found your website by way of Google while looking for a similar subject, your website came up. It appears good. I’ve bookmarked it in my google bookmarks to visit then. Hello there. I found your web site by way of Google while looking for a related topic, your web site got here up. It appears good. I’ve bookmarked it in my google bookmarks to come back then. Hello there. I found your web site via Google whilst searching for a similar matter, your site got here up. It appears to be good. I have bookmarked it in my google bookmarks to visit then. Hi there. I discovered your web site via Google while looking for a comparable topic, your website got here up. It appears great. I’ve bookmarked it in my google bookmarks to come back then. Hey there. I found your web site by means of Google even as looking for a comparable topic, your website came up. It seems great. I’ve bookmarked it in my google bookmarks to visit then. Hey there. I discovered your blog via Google at the same time as looking for a comparable matter, your website came up. It seems great. I have bookmarked it in my google bookmarks to come back then. Hiya, I’m really glad I’ve found this info. Nowadays bloggers publish only about gossip and web stuff and this is really frustrating. A good web site with interesting content, this is what I need. Thank you for making this web site, and I will be visiting again. Do you do newsletters by email? Hiya, I’m really glad I’ve found this information. Today bloggers publish just about gossip and web stuff and this is really annoying. A good web site with exciting content, that is what I need. Thanks for making this web site, and I’ll be visiting again. Do you do newsletters by email? Hello there. I found your blog by the use of Google at the same time as searching for a related matter, your web site came up. It seems to be great. I have bookmarked it in my google bookmarks to come back then. Hello there. I discovered your website via Google even as looking for a similar matter, your website got here up. It seems to be great. I have bookmarked it in my google bookmarks to visit then. Hey there. I discovered your web site by means of Google even as looking for a comparable subject, your site came up. It seems good. I have bookmarked it in my google bookmarks to come back then. Hiya, I’m really glad I’ve found this info. Today bloggers publish only about gossip and web stuff and this is really irritating. A good blog with interesting content, that is what I need. Thank you for making this website, and I’ll be visiting again. Do you do newsletters by email? Hi there. I found your blog by means of Google while searching for a similar topic, your website came up. It seems great. I’ve bookmarked it in my google bookmarks to visit then. Hey there. I found your website by the use of Google at the same time as searching for a comparable matter, your website came up. It appears good. I’ve bookmarked it in my google bookmarks to come back then. Hello there. I discovered your site by the use of Google while searching for a related topic, your web site got here up. It seems good. I’ve bookmarked it in my google bookmarks to visit then. Hiya, I am really glad I have found this information. Nowadays bloggers publish only about gossip and web stuff and this is actually frustrating. A good web site with exciting content, this is what I need. Thanks for making this web-site, and I will be visiting again. Do you do newsletters by email? Hiya, I’m really glad I’ve found this info. Today bloggers publish only about gossip and internet stuff and this is really annoying. A good web site with interesting content, that is what I need. Thank you for making this site, and I will be visiting again. Do you do newsletters by email? Hello there. I discovered your web site by means of Google even as looking for a related matter, your site came up. It appears to be great. I have bookmarked it in my google bookmarks to come back then. Hello there. I discovered your web site via Google at the same time as searching for a comparable subject, your site came up. It appears good. I’ve bookmarked it in my google bookmarks to come back then. Hiya, I am really glad I have found this information. Nowadays bloggers publish just about gossip and internet stuff and this is really annoying. A good blog with interesting content, this is what I need. Thank you for making this web-site, and I’ll be visiting again. Do you do newsletters by email? Hi there. I discovered your web site by means of Google whilst looking for a related subject, your website got here up. It looks good. I’ve bookmarked it in my google bookmarks to visit then. Hi there. I discovered your website via Google while searching for a similar subject, your web site got here up. It seems to be great. I have bookmarked it in my google bookmarks to visit then. Hi there. I found your blog by means of Google whilst searching for a related subject, your site came up. It seems to be great. I’ve bookmarked it in my google bookmarks to visit then. Hiya, I’m really glad I’ve found this information. Nowadays bloggers publish just about gossip and internet stuff and this is actually irritating. A good web site with interesting content, that is what I need. Thank you for making this website, and I will be visiting again. Do you do newsletters by email? Hiya, I am really glad I have found this info. Today bloggers publish only about gossip and web stuff and this is actually frustrating. A good site with interesting content, this is what I need. Thanks for making this site, and I will be visiting again. Do you do newsletters by email? Hiya, I’m really glad I’ve found this information. Today bloggers publish only about gossip and internet stuff and this is really frustrating. A good website with interesting content, this is what I need. Thanks for making this site, and I’ll be visiting again. Do you do newsletters by email? Hiya, I’m really glad I have found this info. Today bloggers publish only about gossip and web stuff and this is really frustrating. A good website with interesting content, that’s what I need. Thanks for making this web-site, and I will be visiting again. Do you do newsletters by email? Hey there. I found your website by the use of Google whilst searching for a related matter, your web site came up. It looks great. I’ve bookmarked it in my google bookmarks to come back then. Hiya, I’m really glad I have found this information. Nowadays bloggers publish just about gossip and web stuff and this is really annoying. A good site with exciting content, that’s what I need. Thanks for making this web-site, and I’ll be visiting again. Do you do newsletters by email? Hello there. I discovered your site by means of Google even as looking for a similar topic, your web site came up. It appears to be great. I have bookmarked it in my google bookmarks to visit then. Hey there. I found your web site by means of Google while searching for a related matter, your web site got here up. It appears good. I have bookmarked it in my google bookmarks to visit then. Hello there. I discovered your site by means of Google even as looking for a related matter, your web site got here up. It seems to be great. I have bookmarked it in my google bookmarks to visit then. Hiya, I’m really glad I’ve found this information. Nowadays bloggers publish only about gossip and internet stuff and this is really irritating. A good site with exciting content, that’s what I need. Thank you for making this web site, and I will be visiting again. Do you do newsletters by email? Hiya, I am really glad I have found this information. Today bloggers publish just about gossip and net stuff and this is really irritating. A good website with exciting content, that’s what I need. Thank you for making this site, and I will be visiting again. Do you do newsletters by email? Hiya, I’m really glad I have found this info. Nowadays bloggers publish only about gossip and net stuff and this is actually frustrating. A good web site with interesting content, that is what I need. Thanks for making this website, and I will be visiting again. Do you do newsletters by email? Hiya, I’m really glad I’ve found this info. Today bloggers publish only about gossip and net stuff and this is actually annoying. A good website with interesting content, this is what I need. Thanks for making this website, and I’ll be visiting again. Do you do newsletters by email? Hi there. I discovered your blog via Google even as looking for a comparable topic, your website got here up. It seems to be great. I’ve bookmarked it in my google bookmarks to come back then. Hiya, I am really glad I have found this info. Nowadays bloggers publish just about gossip and web stuff and this is actually annoying. A good website with exciting content, this is what I need. Thanks for making this web site, and I’ll be visiting again. Do you do newsletters by email? Hello there. I discovered your web site by way of Google at the same time as looking for a related topic, your web site got here up. It seems great. I’ve bookmarked it in my google bookmarks to visit then. Hiya, I am really glad I have found this information. Today bloggers publish just about gossip and net stuff and this is actually frustrating. A good site with exciting content, that’s what I need. Thanks for making this website, and I will be visiting again. Do you do newsletters by email? Hiya, I am really glad I have found this info. Today bloggers publish only about gossip and web stuff and this is actually irritating. A good site with interesting content, that is what I need. Thank you for making this web-site, and I will be visiting again. Do you do newsletters by email? Hi there. I found your site by way of Google whilst looking for a related topic, your website got here up. It appears great. I have bookmarked it in my google bookmarks to visit then. Hi there. I found your blog by the use of Google whilst searching for a similar topic, your website came up. It seems great. I’ve bookmarked it in my google bookmarks to visit then. Hiya, I’m really glad I’ve found this info. Nowadays bloggers publish only about gossip and web stuff and this is actually irritating. A good web site with exciting content, this is what I need. Thanks for making this web site, and I will be visiting again. Do you do newsletters by email? Hiya, I’m really glad I have found this info. Nowadays bloggers publish only about gossip and internet stuff and this is really irritating. A good site with interesting content, that is what I need. Thank you for making this website, and I’ll be visiting again. Do you do newsletters by email? Hello there. I discovered your site by means of Google whilst searching for a related topic, your site got here up. It appears to be great. I’ve bookmarked it in my google bookmarks to visit then. Hi there. I discovered your website by way of Google while searching for a comparable subject, your web site got here up. It looks good. I have bookmarked it in my google bookmarks to visit then. Hello there. I discovered your blog by way of Google while looking for a related subject, your site came up. It seems great. I’ve bookmarked it in my google bookmarks to visit then. Hiya, I am really glad I have found this info. Today bloggers publish only about gossip and web stuff and this is really annoying. A good website with interesting content, this is what I need. Thank you for making this site, and I’ll be visiting again. Do you do newsletters by email? Hi there. I found your web site via Google while searching for a similar subject, your website got here up. It seems to be good. I’ve bookmarked it in my google bookmarks to come back then. Hiya, I’m really glad I have found this information. Nowadays bloggers publish just about gossip and web stuff and this is actually irritating. A good website with interesting content, this is what I need. Thank you for making this website, and I’ll be visiting again. Do you do newsletters by email? Hi there. I discovered your website by way of Google whilst searching for a related subject, your web site got here up. It looks great. I have bookmarked it in my google bookmarks to come back then. Hiya, I’m really glad I have found this info. Nowadays bloggers publish just about gossip and web stuff and this is actually irritating. A good web site with exciting content, that is what I need. Thank you for making this site, and I’ll be visiting again. Do you do newsletters by email? Hiya, I’m really glad I’ve found this info. Today bloggers publish just about gossip and web stuff and this is actually frustrating. A good site with exciting content, that is what I need. Thanks for making this web site, and I will be visiting again. Do you do newsletters by email? Hey there. I found your blog by way of Google even as looking for a comparable topic, your web site came up. It appears to be great. I’ve bookmarked it in my google bookmarks to come back then. Hiya, I’m really glad I have found this info. Today bloggers publish just about gossip and web stuff and this is really irritating. A good web site with exciting content, this is what I need. Thanks for making this web-site, and I’ll be visiting again. Do you do newsletters by email? Hi there. I discovered your web site by means of Google while searching for a related topic, your website got here up. It appears great. I’ve bookmarked it in my google bookmarks to come back then. Hiya, I’m really glad I have found this information. Nowadays bloggers publish only about gossip and net stuff and this is actually irritating. A good web site with interesting content, this is what I need. Thanks for making this site, and I’ll be visiting again. Do you do newsletters by email? Hiya, I am really glad I’ve found this info. Nowadays bloggers publish just about gossip and internet stuff and this is actually annoying. A good blog with exciting content, that is what I need. Thank you for making this web-site, and I will be visiting again. Do you do newsletters by email? Hiya, I’m really glad I have found this information. Nowadays bloggers publish only about gossip and internet stuff and this is actually annoying. A good website with exciting content, that is what I need. Thanks for making this web site, and I’ll be visiting again. Do you do newsletters by email? Hiya, I’m really glad I’ve found this information. Nowadays bloggers publish only about gossip and web stuff and this is really frustrating. A good site with interesting content, that is what I need. Thanks for making this web-site, and I will be visiting again. Do you do newsletters by email? Hello there. I found your website by means of Google at the same time as looking for a related matter, your website came up. It seems to be great. I’ve bookmarked it in my google bookmarks to come back then. Hiya, I’m really glad I’ve found this information. Nowadays bloggers publish only about gossip and web stuff and this is really annoying. A good website with interesting content, this is what I need. Thank you for making this site, and I will be visiting again. Do you do newsletters by email? Hello there. I found your site by way of Google at the same time as looking for a similar matter, your site came up. It seems good. I have bookmarked it in my google bookmarks to visit then. Hiya, I am really glad I have found this info. Today bloggers publish just about gossip and internet stuff and this is actually irritating. A good web site with interesting content, this is what I need. Thanks for making this web site, and I’ll be visiting again. Do you do newsletters by email? Hey there. I discovered your website by way of Google even as searching for a related matter, your website came up. It seems good. I have bookmarked it in my google bookmarks to come back then. Hiya, I’m really glad I have found this info. Nowadays bloggers publish just about gossip and internet stuff and this is really irritating. A good website with exciting content, that is what I need. Thank you for making this web site, and I’ll be visiting again. Do you do newsletters by email? Hiya, I am really glad I’ve found this info. Today bloggers publish just about gossip and internet stuff and this is really irritating. A good site with interesting content, that’s what I need. Thanks for making this web-site, and I’ll be visiting again. Do you do newsletters by email? Hiya, I am really glad I’ve found this information. Nowadays bloggers publish just about gossip and internet stuff and this is actually annoying. A good blog with interesting content, this is what I need. Thanks for making this web site, and I’ll be visiting again. Do you do newsletters by email? Hiya, I am really glad I’ve found this info. Today bloggers publish only about gossip and web stuff and this is actually annoying. A good blog with interesting content, this is what I need. Thank you for making this site, and I’ll be visiting again. Do you do newsletters by email? Hiya, I am really glad I’ve found this info. Today bloggers publish just about gossip and web stuff and this is actually frustrating. A good site with exciting content, this is what I need. Thanks for making this web site, and I’ll be visiting again. Do you do newsletters by email? Hiya, I am really glad I’ve found this info. Today bloggers publish only about gossip and web stuff and this is actually annoying. A good site with exciting content, this is what I need. Thanks for making this site, and I’ll be visiting again. Do you do newsletters by email? Hiya, I am really glad I’ve found this info. Nowadays bloggers publish just about gossip and web stuff and this is actually frustrating. A good web site with interesting content, this is what I need. Thanks for making this website, and I will be visiting again. Do you do newsletters by email? I just want to say I am newbie to weblog and absolutely liked your web-site. Most likely I’m planning to bookmark your website . You really come with amazing well written articles. Thanks a bunch for revealing your blog. Hey there. I found your blog by means of Google at the same time as looking for a related topic, your web site got here up. It seems great. I’ve bookmarked it in my google bookmarks to come back then. Hey there. I found your blog by way of Google while looking for a similar matter, your web site came up. It looks good. I have bookmarked it in my google bookmarks to come back then. Hiya, I am really glad I’ve found this information. Today bloggers publish only about gossip and internet stuff and this is really frustrating. A good web site with interesting content, that’s what I need. Thank you for making this web site, and I will be visiting again. Do you do newsletters by email? Hiya, I am really glad I’ve found this info. Today bloggers publish just about gossip and web stuff and this is actually frustrating. A good site with exciting content, that is what I need. Thanks for making this web-site, and I will be visiting again. Do you do newsletters by email? Hiya, I am really glad I have found this information. Nowadays bloggers publish only about gossip and net stuff and this is really irritating. A good site with exciting content, that is what I need. Thanks for making this website, and I will be visiting again. Do you do newsletters by email? Hiya, I’m really glad I’ve found this info. Nowadays bloggers publish just about gossip and internet stuff and this is really frustrating. A good web site with exciting content, that is what I need. Thank you for making this web-site, and I will be visiting again. Do you do newsletters by email? Hiya, I am really glad I have found this information. Nowadays bloggers publish just about gossip and internet stuff and this is actually irritating. A good site with exciting content, this is what I need. Thank you for making this site, and I’ll be visiting again. Do you do newsletters by email? Hey there. I found your website by means of Google while looking for a similar matter, your web site got here up. It appears to be great. I’ve bookmarked it in my google bookmarks to visit then. Hiya, I’m really glad I’ve found this info. Nowadays bloggers publish only about gossip and web stuff and this is really irritating. A good website with interesting content, that is what I need. Thanks for making this website, and I will be visiting again. Do you do newsletters by email? Hi there. I found your blog via Google even as looking for a similar subject, your website got here up. It seems to be good. I’ve bookmarked it in my google bookmarks to visit then. Hi there. I found your site by means of Google even as searching for a related topic, your site came up. It appears good. I’ve bookmarked it in my google bookmarks to come back then. Hiya, I’m really glad I have found this information. Nowadays bloggers publish only about gossip and internet stuff and this is actually irritating. A good blog with interesting content, that is what I need. Thank you for making this website, and I will be visiting again. Do you do newsletters by email? Hiya, I am really glad I’ve found this information. Nowadays bloggers publish only about gossip and web stuff and this is really frustrating. A good site with exciting content, this is what I need. Thanks for making this website, and I’ll be visiting again. Do you do newsletters by email? Hello there. I found your site by way of Google at the same time as looking for a similar matter, your web site came up. It seems good. I’ve bookmarked it in my google bookmarks to visit then. Hiya, I am really glad I have found this info. Nowadays bloggers publish only about gossip and web stuff and this is actually frustrating. A good website with exciting content, that’s what I need. Thank you for making this web site, and I will be visiting again. Do you do newsletters by email? Hi there. I discovered your website via Google whilst looking for a comparable subject, your site came up. It seems to be great. I’ve bookmarked it in my google bookmarks to come back then. Hiya, I am really glad I have found this info. Nowadays bloggers publish just about gossip and net stuff and this is actually irritating. A good blog with interesting content, that’s what I need. Thanks for making this site, and I’ll be visiting again. Do you do newsletters by email? Hey there. I found your blog by way of Google even as looking for a comparable subject, your site got here up. It seems to be good. I’ve bookmarked it in my google bookmarks to come back then. Hey there. I found your website via Google even as searching for a related topic, your web site got here up. It seems great. I have bookmarked it in my google bookmarks to come back then. Hello there. I discovered your blog by way of Google while looking for a related topic, your web site came up. It looks great. I’ve bookmarked it in my google bookmarks to visit then.